Coming up with delicious meals for my Fast Diet days has been tricky because of the very strict calorie limit, but Shirataki noodles have made inspiration so much easier. Last night I whipped up this Hoisin chicken with Shirataki noodles and plenty of colourful vegetables. At a total of 280 calories for the entire meal, this left me plenty of room to have snacks earlier in the day. I’m enjoying The Fast Diet so far – and I’m beginning to see results already. 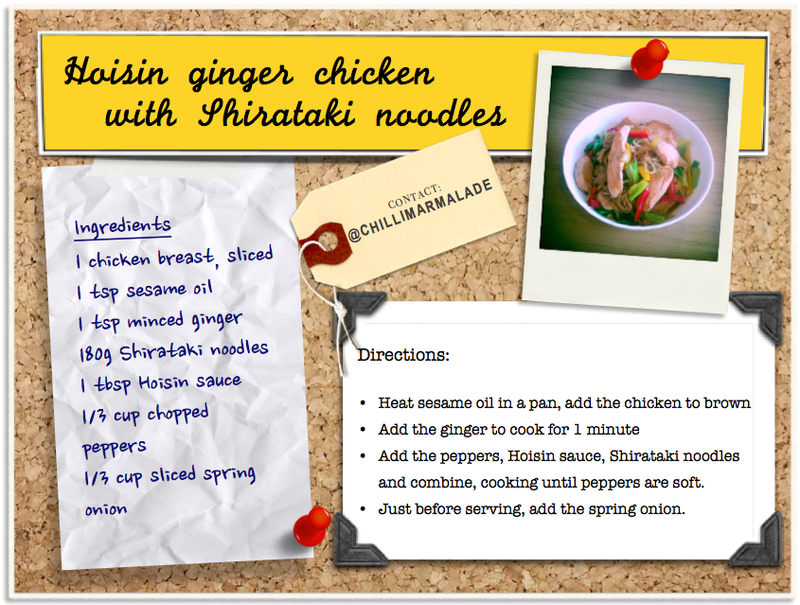 If you’d like to check out more Fast Diet ideas, see my first Shirataki noodle recipe, and my very filling broccoli, cauliflower and parsnip soup. Watched my friend Ted Reader on Breakfast Television in Vancouver this morning. You gotta love time shifting on TV. Cool, composed and professional as always. Ted, make sure you have sushi while you’re there! So I’ve had some chipotle in adobo sauce sitting in the cupboard for a while trying to figure out how to use them. The one troll likes spicy but the other one doesn’t so my dilemma. I blended the chipotle with honey, lime and added a rehydrated Guajillo pepper. 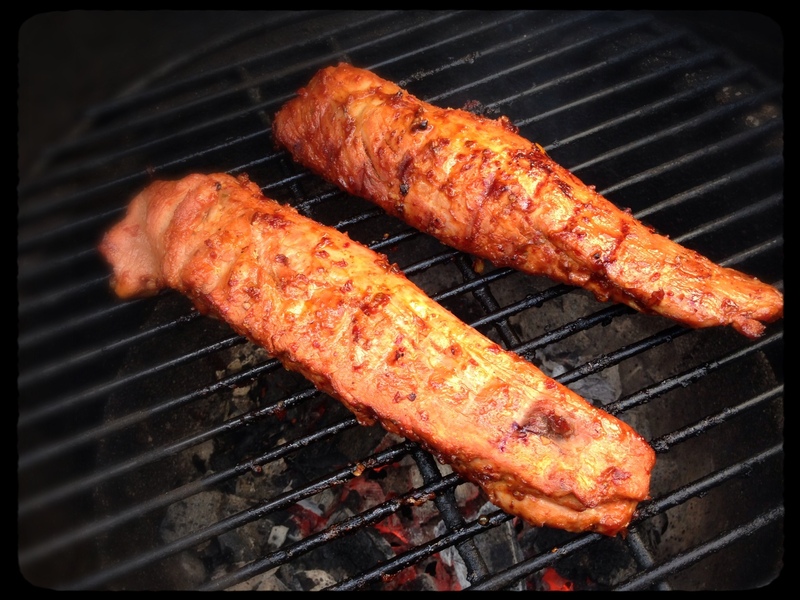 The pork tenderloin marinated in the saucy sweet and spicy bath for 4 hours and then was grilled over cherry wood. The accompaniment was a take on a Insalata Caprese replacing the mozzarella with avocado. 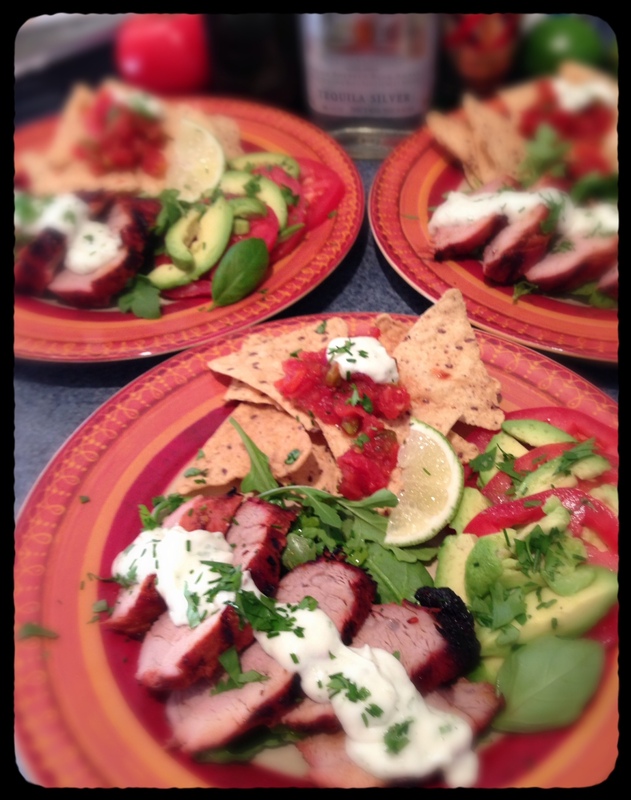 Sour cream flavoured with lime juice and zest brought it all together. The honey cut the spiciness and made both trolls very happy. Along with the tortilla chips that went on the plate. This little piggy went all the way down! 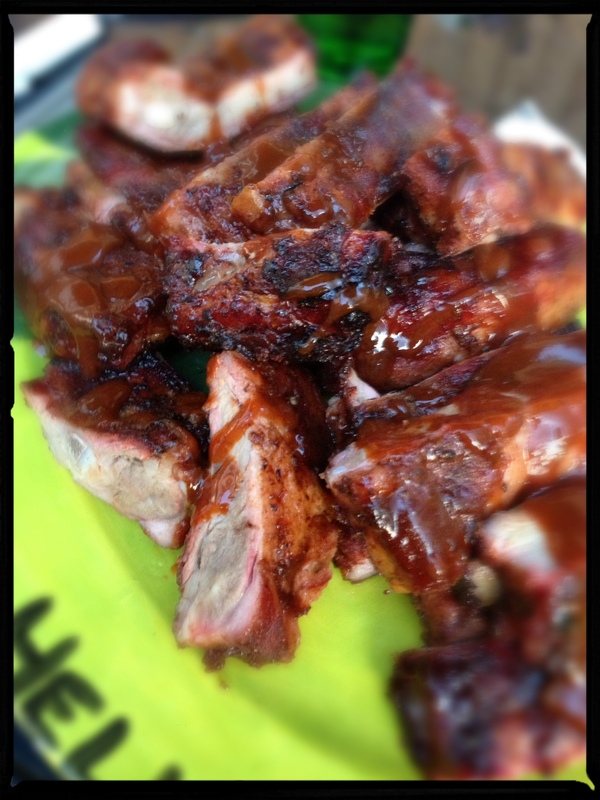 One of my favorite foods – Slow smoke barbecue pork ribs. It doesn’t get any better than this. Yesterday the overhanging branches in the backyard were cut down, the grass was cut, the mulch was spread and the lights that those damn squirrels chewed through were fixed. The flowers are in, the herbs are planted and we’re done. All I have to do is remember to water everything. I’m usually good for about 4 weeks before I start to slip and then the garden becomes survival of the fittest! 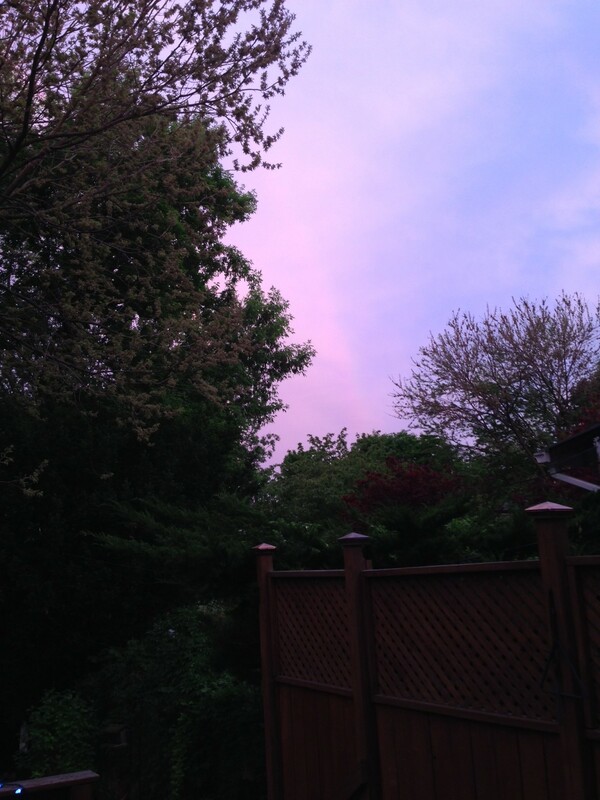 This morning I woke to a beautiful rainbow in a red sky. The rainbow was gone by the time I took the picture. I just thought I’d share that. 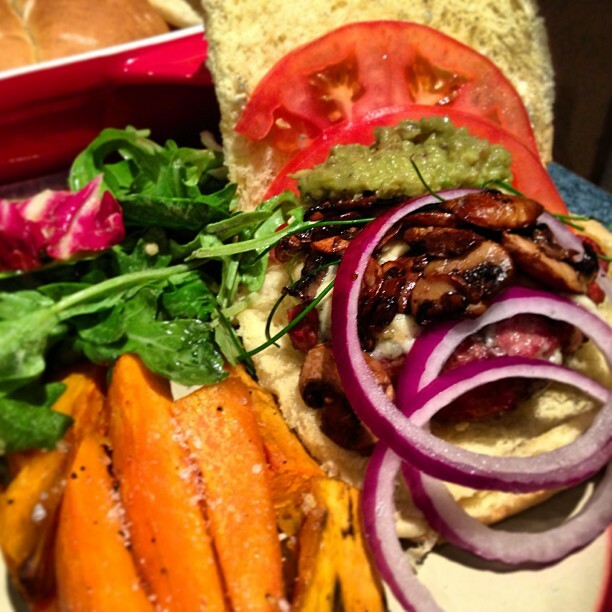 I try to do all or at least part of our meals outside. 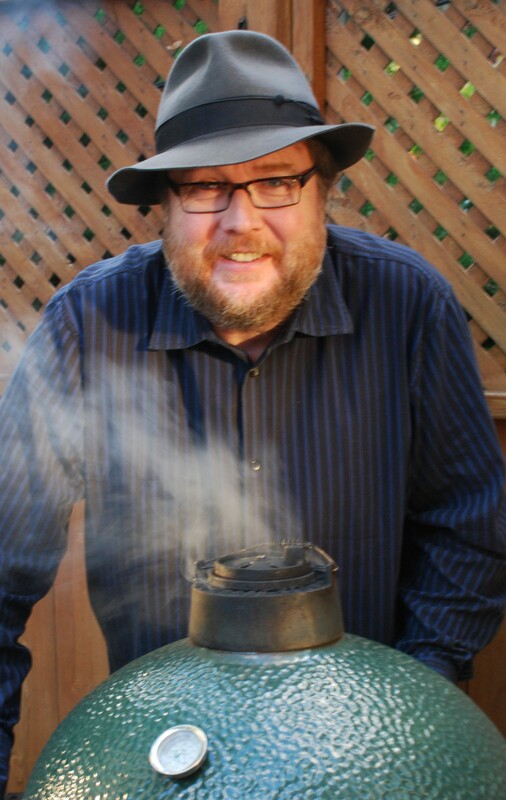 Be it on the BGE, Weber, or gas grill. 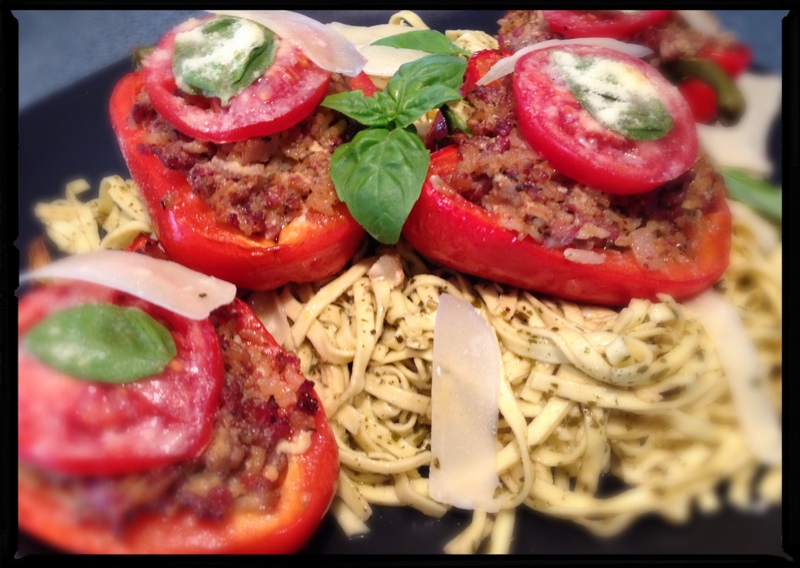 Last night we had sausage stuffed peppers with pesto linguini. The peppers were baked on the BGE with oak smoke. The linguini wasn’t. Since I now have herbs growing again they are taking a prominent position in everything I create. The packaged stuff is gone till the fall, or till I kill it all off. This summer the plan is to make our own sausages, the summit being blood sausage. It’s my death-row meal. Red peppers stuffed with tasty sausage love! I’ve spent the past year deciding where my future and my present lies. The path most familiar and comfortable is not necessarily the one that make you most happy and peaceful. So you throw yourself against the wall and see if you stick. 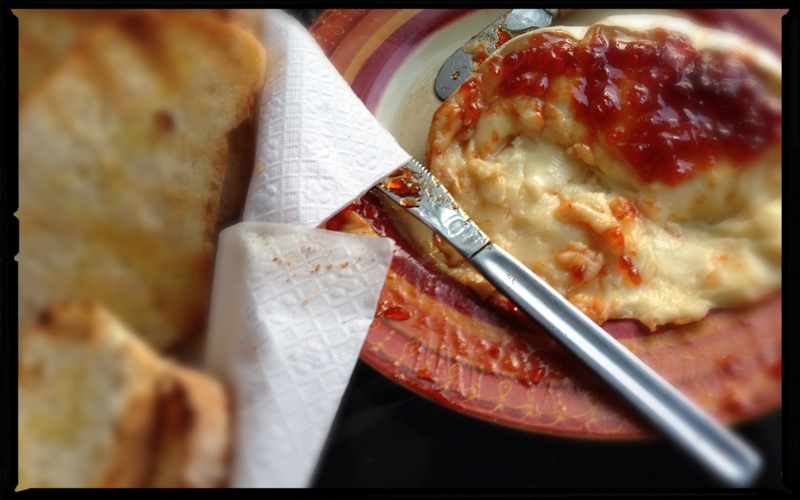 As I said at the beginning of my Blog life, food has always been the constant in my life. Creating, relaxing, and showing love to my family and friends. I’ve managed to find peace and appreciation in the friends I’ve found, and the meals I’ve created. Where to go from here? I throw it out to the universe. I’m having fun and I hope that you will continue to too. There is something about taking ordinary ingredients and different views of them from this big world and distilling them into a mouthful of wonderment. 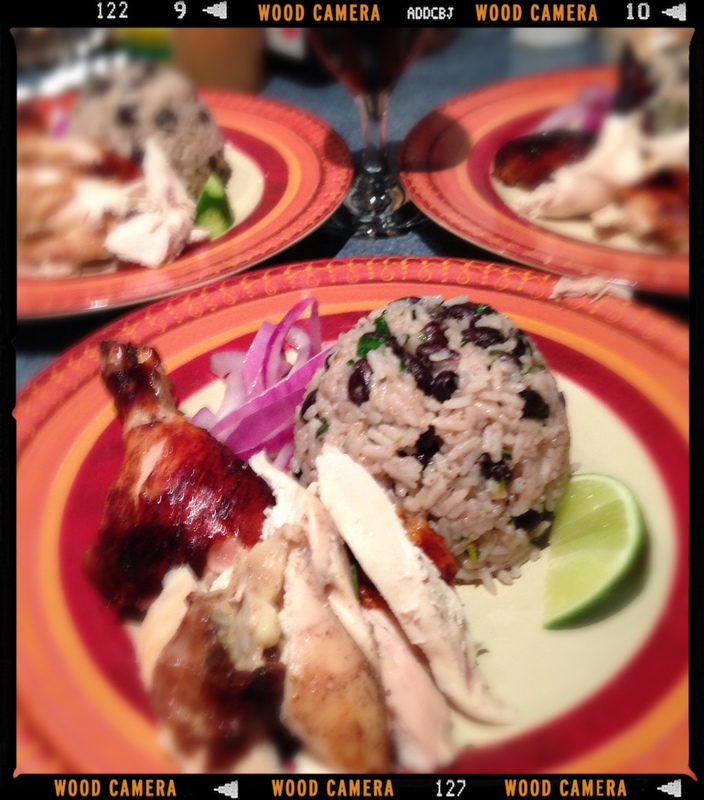 Last night we dined on rotisserie Jerk Chicken and dirty rice with black beans. My favourite marinade base has become yogurt. The chicken soaked in yogurt and my jerk spices for 4 hours. The yogurt having no dominating taste imparts the spices through and makes the meat juicy. I’ve used it as a medium for chicken, lamb, and now as a base for salad dressings instead of mayonnaise. Eating well doesn’t mean expensive. It meanings instilling love and passion into what you do. Spicy but not too hot! Of all the things my kids (well adults) love is catfish? 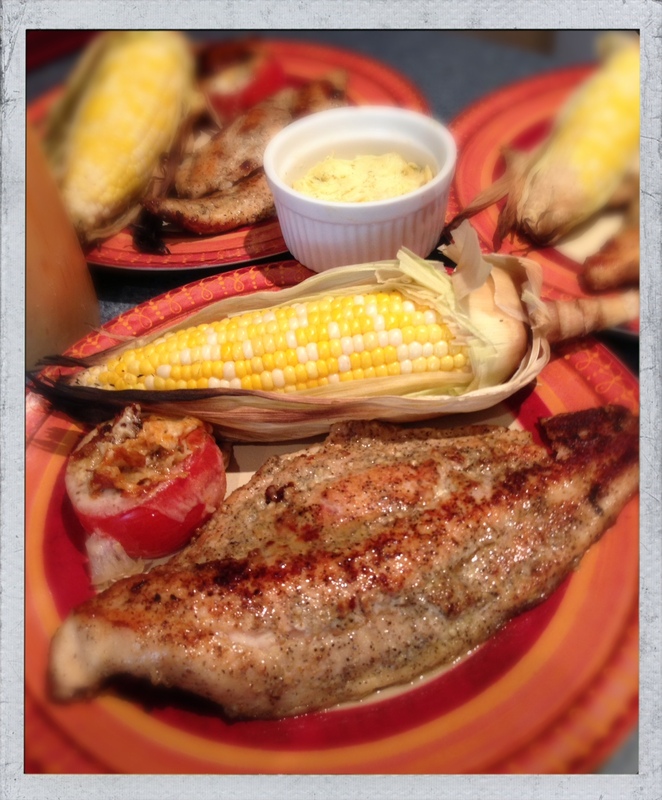 Don’t know how this came to being in our lives, but we love catfish! It;s not like it’s a Canadian thing and we don’t have southern roots but somehow this came to be a monthly staple in our home. Lightly spiced with salt, pepper (heavy on the pepper), lemon rind and a squeeze of lemon juice just before it’s served. 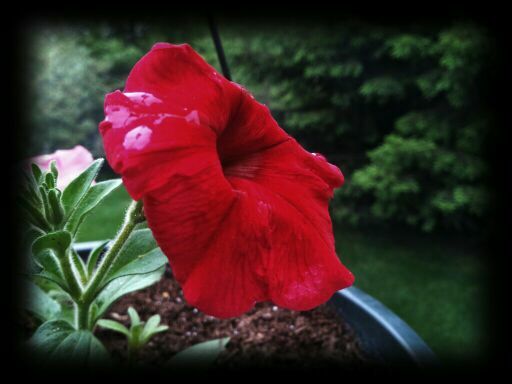 In the winter this can add a fragrance to the house for days, so when I can I take it outside. 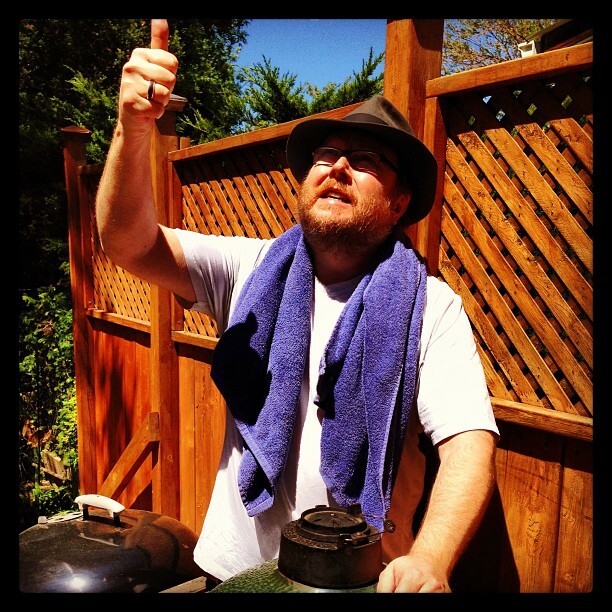 To keep it from breaking and falling apart on the grill, I use my cast iron plate on the gas grill so I can keep it together. Trying to utilize everything all the time, there was lonely corn left behind from the weekend and some tomatoes. So to add to the feast I grilled the corn in the husks and baked the tomatoes with oregano and mozzarella. Lime chilli butter too boot! Off to the market for tonight! Catfish sing in the dead on night?….Sorry wrong song. This post is for Adriana Rivera, our friend from Mexico Distrito Federal. When she came to visit this past February she brought with her some tasty goodies, one of which was achiote paste. 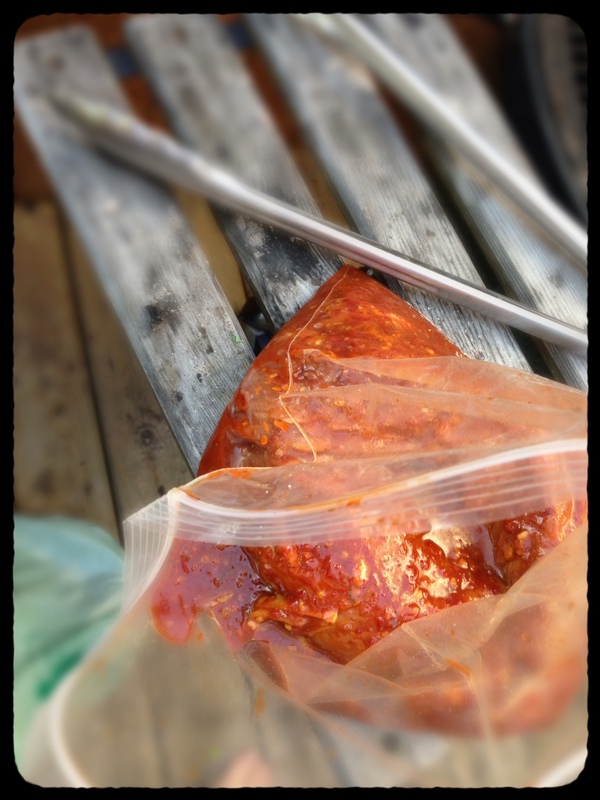 Inasmuch as I had the achiote paste I had to make cochinata pibil. So, I did and it was really good. 🙂 Thanks, Adriana!! Alabama White BBQ Sauce heaven! So this weekend ended with a bang. Not just the fireworks but the thunderstorm that came minutes after it. Watching all the soaked sightseers running up the street was like a scene from a disaster movie. There used to be a few signs down here that said “Welcome to the Beach. Get out of my parking spot!” I must admit that when I moved down here 20 years ago the crowds that would show up on long weekend were miniscule compared to the amounts that show up now a days. Sometimes I feel like putting those signs back up or just hightailing it out of here. We have Victoria Day, Canada Day, Simcoe Day, Labour Day, and the Jazz Festival where 100,000 people show up to wander the street. It’s nice living here but when you can’t move your car for fear of losing your parking spot you start reevaluating. So food, because that what this is all about was large, tasty, and fun. 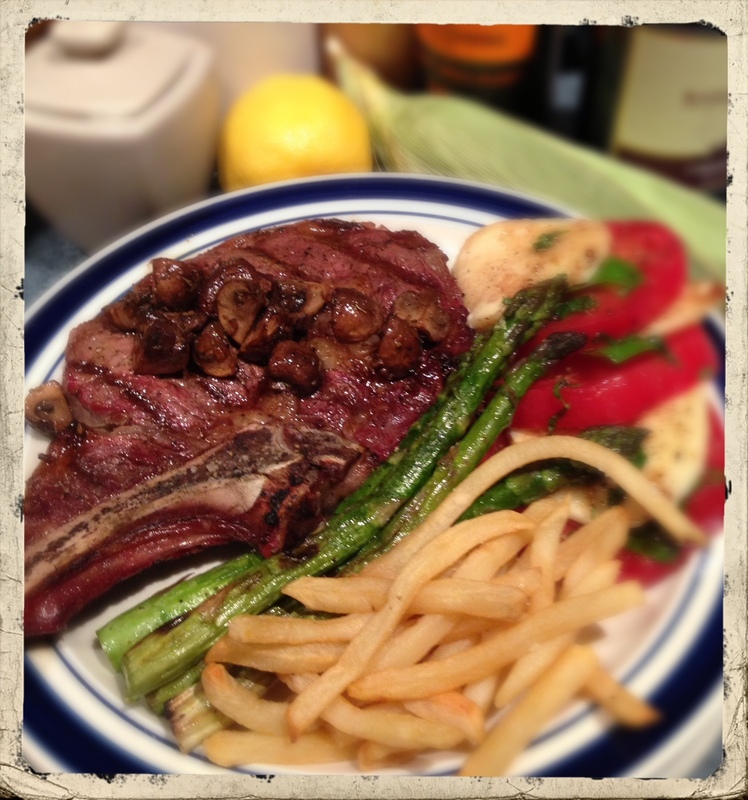 Sunday we started with grilled Rib Steaks on the BGE, Grilled asparagus and a Caprese salad. First time we could eat outside this year. The surrounding trees are sharing their pollen and seeds all around and you need to dust the table once an hour, but being outside was nice and relaxing. Enough was left over for baguette sandwiches on Monday. Victoria Day was orgasmic. I finally made Alabama White BBQ Sauce. 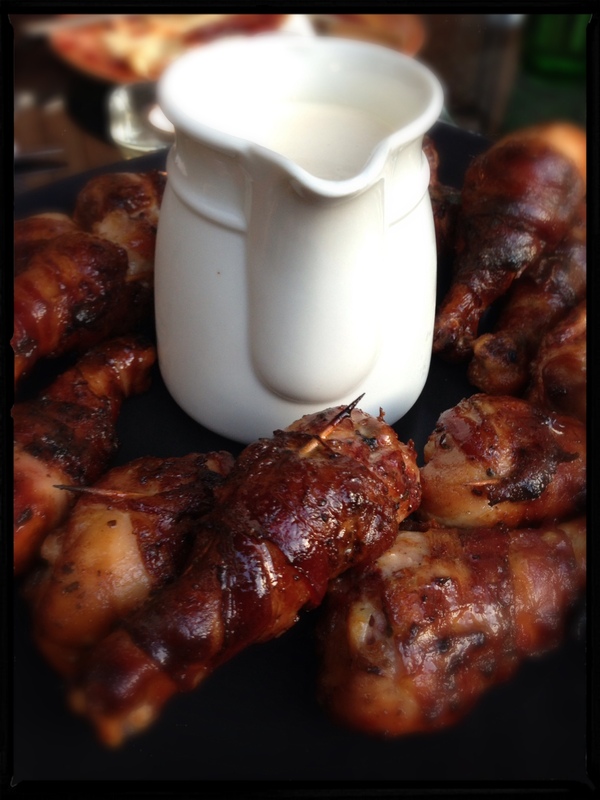 Phenomenal on the hickory smoked, bacon wrapped drumsticks! 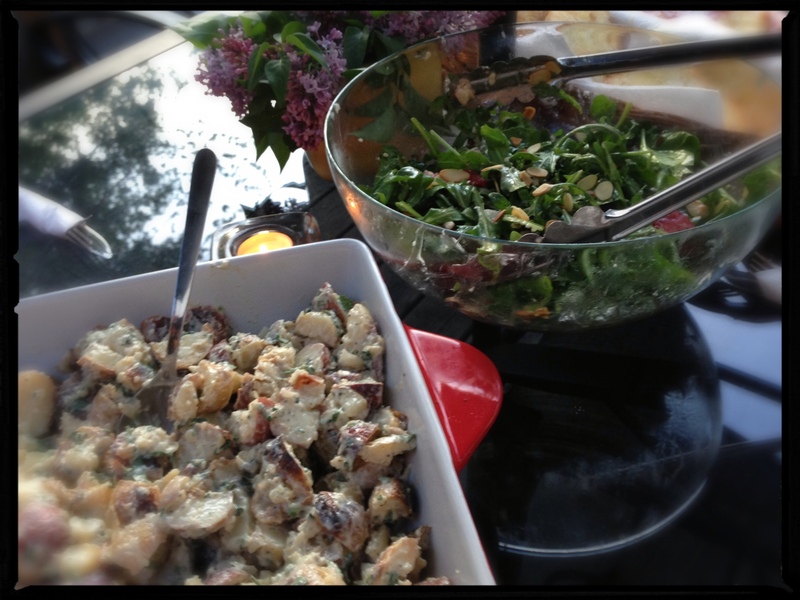 Also embraced slow smoked ribs with sauce, roasted potato salad in a yogurt base, and field greens with strawberries red onion, and almonds courtesy of Vicky and her culinary skills. The appetizer was the trolls favourite, smoked brie. I hope everybody enjoyed good food, good times and family and friends. Have a great week and be well. Because you gotta graze sometime!